Um . 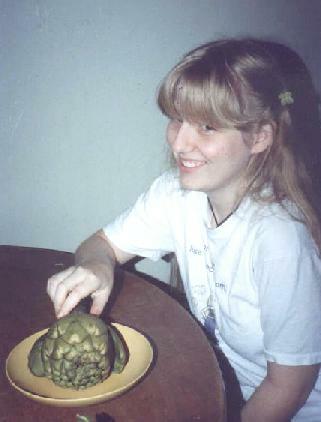 . . an artichoke? This recipe makes one serving. Get another bowl to discard the leaves, and get a spoon, a fork, and a knife. Start taking the outside leaves off the outside of the artichoke. Usually the outermost ones will be stringy as you pull them off; they'll take bits of the stem with them as you peel. These stringy ones are not very yummy to eat and you can put them in your discard bowl. When you get to leaves that are no longer bringing off stringy bits of stem, you can stop peeling. (Usually it's a couple of layers.) Take a non-stringy leaf off and dip its bottom in your dipping dish, and bite the thick meaty part at the bottom of the leaf, or as much of it as you like to eat. (Just don't eat the point. :) ) Discard your leaves in the other bowl and just keep peeling away. As you get closer to the center of the vegetable, the white part gets bigger and bigger but the leaves get smaller and smaller. When you see leaves with a hint of purple on them, stop eating. Peel those leaves off until you get to the hairy center . . . yes, artichokes have HAIR!! This is the difficult part and I may not be able to explain it satisfactorily. You get your spoon and dig the hair out. There is a somewhat soft, meaty part underneath; be careful not to dig all of that out too, because that is the heart and that is what you are going to eat. It is the best part. Try to just scrape the hair off and leave as much of the heart as possible. Once that's done and your hands are seriously messy, you'll need to get your knife and begin cutting off the stem and any parts of the outside of the heart that look rough or unappetizing. You might wanna wash your hands after all that; then you get your fork and knife and cut the heart up, and dip it in the butter and eat it. :) YUM! Now you have a lot of dishes to wash but it is worth it.